Welcome to the promotional page for Bingo Fabulous. Here you will find details of promotions that we recommend including information on how to join the site as a new player. 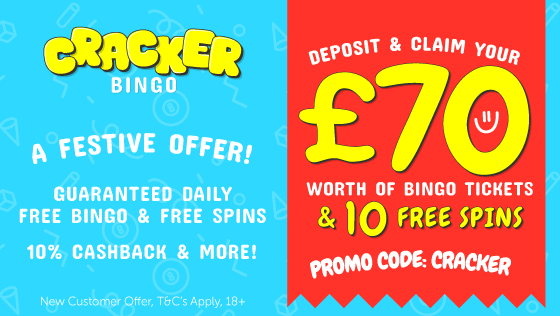 Alongside this we may detail previous promotions if available, for you to see the type of offers that Bingo Fabulous gives its players. Every now and again you will find an online bingo site offers a good sized guaranteed jackpot prize, which is nice. 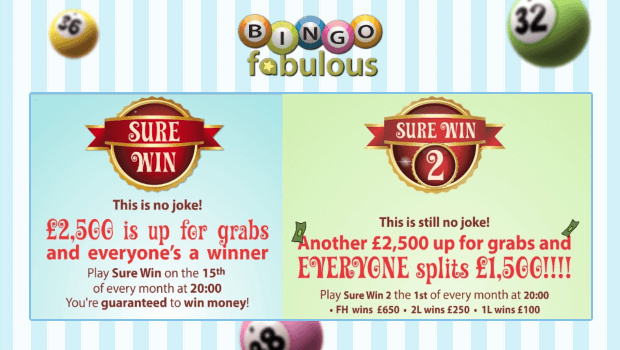 However, play at Bingo Fabulous and you don’t get just one BIG guaranteed jackpot game but you get two! Add to this fact that they are not ‘one off’ specials but games that are played every month, you would be forgiven for wondering how this could be even better! Well it is better, as with these ‘Sure Win’ games, everyone who plays them is ‘guaranteed’ a prize! The first of these two games plays at 8pm on the 15th of every month. The total jackpot prize for this online bingo game is £2,500 and tickets will cost you £1 each. Now if you are looking for value for money bingo then you should consider purchasing 12 tickets. The reason being is that for every 12 tickets you buy, you will be given a further 10 bingo tickets for FREE! (maximum tickets allowed in total is 96). 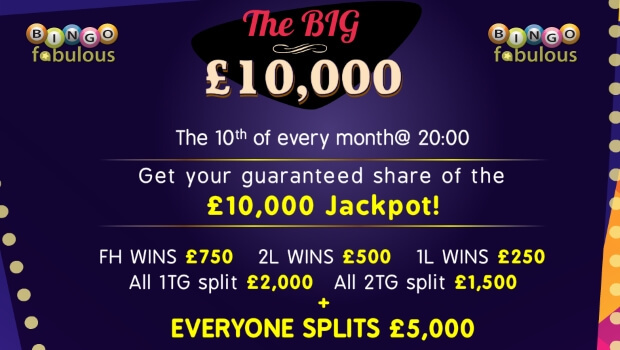 The game is a 90 ball bingo game and the prize money is split as £400 for the line winner, £600 for the two line winner, £1,000 for the full house winner and the final £500 is shared among all non-winning players on a number of tickets purchased basis. Therefore ‘everyone is a winner’. The second Bingo Fabulous Sure Win game is played on the 1st of every month and again at 8pm with tickets £1 each and ten FREE for every 12 purchased. The total prize money available is another £2,500 but this time the line winner will receive £100, the two line winner £250, the full house winner £650 and the then £1,500 will be shared among all non-winning players. This again will be based on number of tickets purchased by each player. So if you would like to play a game of bingo where you can be guaranteed to win a prize plus get free tickets, then do not miss out on the twice monthly Bingo Fabulous Sure Win games! 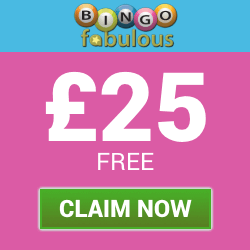 For full terms and conditions of this promotion, please visit the Bingo Fabulous website. What can be better than playing your favourite game of bingo? How about playing your favourite game of bingo with free tickets for a BIG prize? Yes, I think that would do it. If you feel the same then make a date in your diary to join in the big £10,000 game at Bingo Fabulous every month. The game takes place on the 10th of each month at 8:00pm and is played for a line winner, two line winner and full house winner. However the game also creates even more winners as part of the prize pot is split for all 1TG (1 to go) players and 2TG players. Prize values are £250 for the line, £500 for the 2 lines, £750 for the full house. All the 2TG players share a prize pot of £1,500 whilst the 1TG players share £2,000. Even better news is that no matter whether you have won or not ‘everyone’ takes away a share of a £5,000 prize. So nobody goes away empty handed. This is a great game to be a part of as so many winners are created. Added to this you can play this game for FREE by earning FREE tickets through the Bingo Fabulous loyalty plan. Depending on your loyalty level will set the number of free tickets you can claim for free. To qualify you just need to deposit once, play bingo and earn loyalty points to play in the big £10,000 game at Bingo Fabulous. As a bingo pro you will receive 2 free tickets. A bingo master will be awarded 5 free tickets and 10 free tickest go to a bingo champ. Getting even to the first level is extremely easy. As long as you have 1 jewel (loyalty point) you are classed as a Bingo Pro and you get 12 jewels for every £1 deposited. Did you know that there is a special game that is played 5 days of the week to win up to 100 free spins at Bingo Fabulous? Well there is and if you love playing the online slots as much as playing your online bingo, then this is a great regular promotion for you to enjoy. Now what could make this game even better? How about the fact that the tickets to play this special game of bingo are just 1p each! On top of this there are free spins to be won even if you don’t win any of the main prizes because players who are just 1TG or 2TG will still receive a prize. The game itself is a 90 ball bingo game that plays from a Sunday through to a Thursday at 9pm. The game will be played with the line winner receiving 20 free spins, the two line winner receiving 50 free spins and the player shouting bingo on the full house gets the 100 free spins. Then all 1TG (1 to go) players will get 10 spins each and all 2TG players will be awarded 5 free spins each. If you are one of the lucky players to receive free spins, then these will be credited to your account within 72 hours. 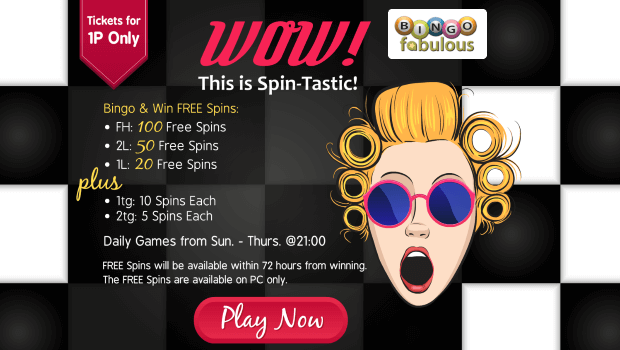 The free spins game you can use will be chosen by Bingo Fabulous and can be used on a PC/Laptop only. Your free spins when used will earn you game points if you win and these game points will then be converted to bonus funds. Any bonus funds you receive must be wagered 80x before withdrawal is permitted. If you are not a member of Bingo Fabulous but would like to take part in any of the promotions detailed on this page, then you can open a new account with their site in just a few minutes. Simply click on the big blue button below or any of the claim buttons you will find within the promotional sections above. These will open up the Bingo Fabulous website for you. Once you arrive on their homepage, just select the large JOIN NOW button that you will see at the top of their page. This opens the online registration form. Complete this in full and your account will be opened and you can then add funds to your account to be able to play their great selection of games. As a new player, you can if you wish accept their welcome offer that is given to players when a first deposit is made. This is basically a 200% cash match offer plus an extra £5 bonus on top. Therefore just add £10 to your new account and you will be awarded a total of £25 extra in bonus funds, giving you £35 to play. Terms and conditions and wagering requirements do apply to any bonus you receive and these details are available on the Bingo Fabulous website. So open an account today, receive a great welcome bonus offer and then join in all the fabulous promotions as detailed above. 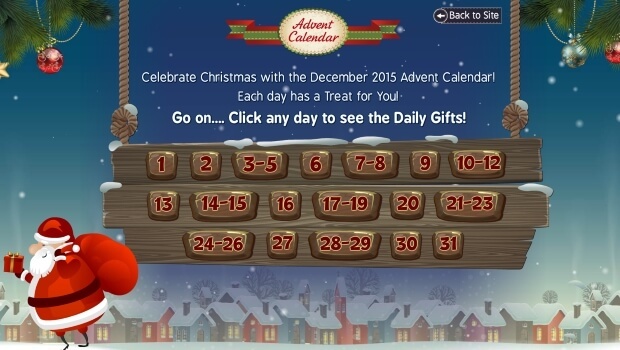 Celebrate the festive season with Bingo Fabulous and enjoy a daily treat with their very own Advent Calendar. The promotion runs the whole of December 2015 from the 1st to the 31st which means there is plenty of treats to be had. Depending on the day in December that you visit the site, you will be able to check the Christmas Treat of the Day and how to participate. To do this, simply visit the promotional page at Bingo Fabulous and select the Advent Calendar offer. You will then be presented with all the dates of the month and click on any date to reveal the offer. Prizes and offers that are available include the chance to win an iPad Air 2 16GB WiFi, a 500GB Xbox 1 console, an iRobot Roomba 620 plus special bonus awards and free tickets to special games. You can also check out the full list of prizes and the individual offers T&C’s by clicking on the terms and conditions link underneath the animated Advent Calendar on their website. So don’t miss out on a fun way to enjoy your bingo this holiday season. Click the button at the bottom of this page and you never know you might just bag yourself an extra gift this Christmas. 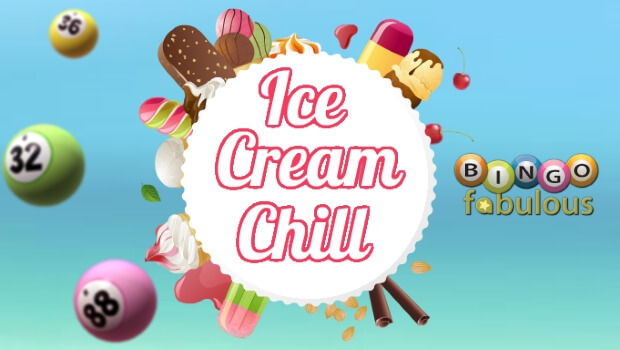 It’s Summer and it’s time to chill and you can definitely chill out with this fabulous Ice Cream Machine that’s up for grabs with Bingo Fabulous. The promotion runs from now, through until Sunday 9th August and there will be a special game every Sunday at 8pm in the Ice Cream Chill bingo room to win a fantastic ice cream machine. Plus there are plenty of chances to get FREE tickets for these games. The first way is simple and straight forward. Simply purchase one ticket and you will automatically get a second ticket for Free! Secondly, if you play during the week before the next Sunday game in the Bingo Buddies Room and bingo on the Ice Cream Cone pattern, you will get 5 free tickets. The maximum number of tickets allowed in total is 96. The Sunday Game takes place at 8pm with all 2TG players receiving a share of £20 and all 1TG players receiving a share of £30. Then the single line winner will receive £50 cash, £100 cash goes to the two line winner and finally the full house winner will win a Fantastic Ice Cream Machine. If there is more than one winner for the full house prize, then all winners will share a cash prize of £200. If you have ever fancied a trip of a lifetime to see the wondrous sites and sounds of Tokyo then this promotion from Bingo Fabulous is just for you. One lucky player is going to win this fabulous VIP prize that will include return flights to Tokyo, Japan staying for 5 nights at the 4* Hotel Monterey Hanzomon. You will also receive a tour of Akihabara Electric Town and get to experience Japanese pop culture. There is also a 1 night stay at the 4* Hotel Granvia, Osaka and whilst you are there you will receive two admission tickets to Universal Studio Japan, in Osaka. There is also £1,000 in spending money! For your chance to win this amazing prize you just need to to earn tickets into the prize draw. 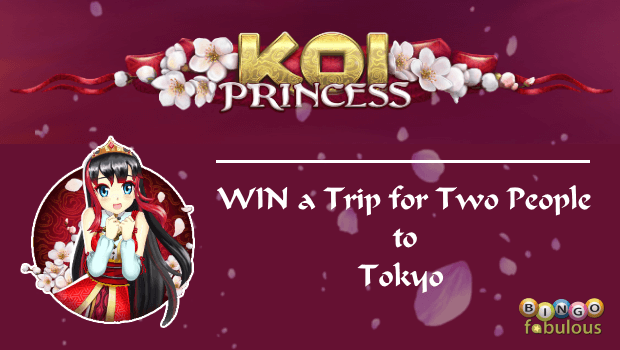 You earn these by playing on the Koi Princess™ or Koi Princess™ Touch. For every 20 real money spins on either version of this slot you will receive an entry into the draw. You can earn a maximum of 50 entries per day. The minimum value per spin must be 20 cents (approx. 15p). Not only is there the top prize of the VIP trip to Tokyo but there are a further 49 cash prizes to be won as well. Now although the promotion on the Bingo Fabulous site is advertised in Euro’s, prizes will be paid in GBP (£’s) but will be subject to exchange rates. Nine players will receive a prize of €100 and 40 players will receive €50. So don’t miss out on your chance to win what is surely a trip of a lifetime for two people to Tokyo. Click the buttons above or below and play at Bingo Fabulous today. Good luck everyone!